For the longest time I've been hearing via the "forums", discussion groups and trade shows all about Plastisol Transfers. I've been waiting to try them and finally got an order large enough to quantify the cost! I ordered them through Transfer Express and the order process was painless. I uploaded my artwork (perfect artwork that was provided to me by my customer). My rep at Transfer Express called me to verify everything that I had put into my online order form. Told me how much it was going to cost me and when I would get them. Boohaa, I got them two days earlier than expected. I needed adult sizes as well as youth sizes so I had them gang two ten inch transfers and an eight inch transfer on one page. Than all I had to do was cut and mark the backing paper for the center mark for alighment. Now to prepare the shirts... heat for 4-6 seconds to remove any manufacturing moisture. Place the transfer on the shirt and align properly. Perfect alternative to screen printing. Of course the more you buy, the less they cost. After the first run of t-shirts, my customer called me up and said they needed more youth sizes... 24 medium and 24 large. 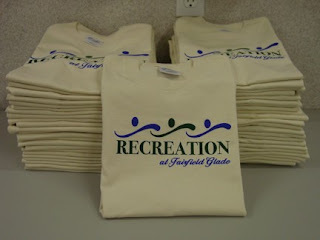 All I had to do was order the shirts and press the transfers and deliver to the customer. I pressed 48 t-shirts, folded and boxed them in two hours and 15 minutes! Lead time can be as short as 3 days. Same day if I have the garments in stock.